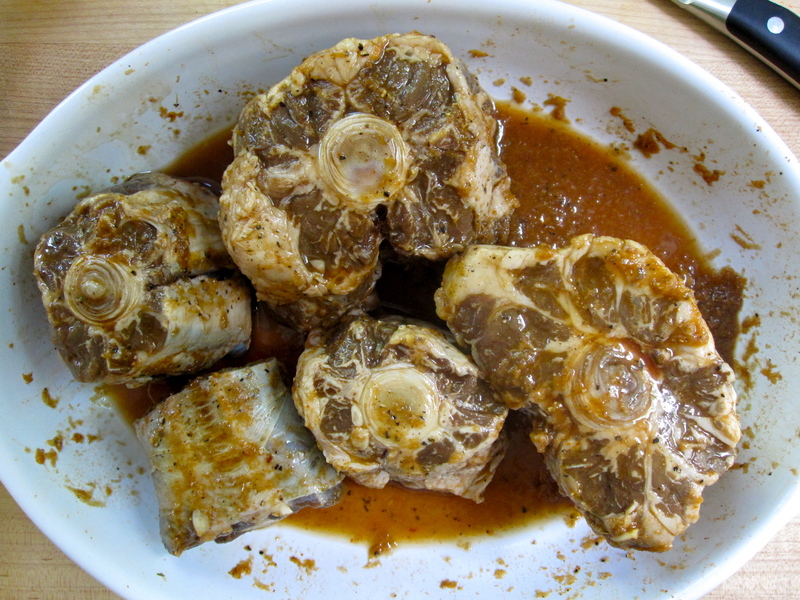 We’ve had a package of oxtails in our freezer since my dad gave them to us at Christmas. I wasn’t ignoring them; I knew they were there. I just wasn’t sure what to do with them. 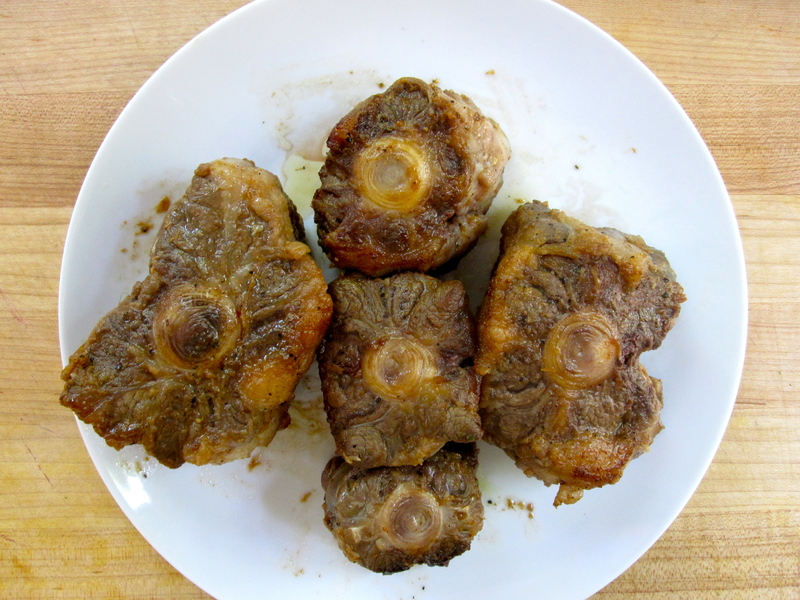 I did know that they were perfect for braising, but beyond that, I was unsure what to do with them once braised. After a little research, I found that many recipes used them for dishes such as soups, stews, and ragouts. But I didn’t want to do that, as the weather has been really nice and summery lately. I wanted to so something relatively light, not heavy like a stew. My thoughts then shifted to something Scott and I have a lot here at home: black bean tacos. I thought I could substitute the oxtail for the black beans and do the same basic taco preparation. 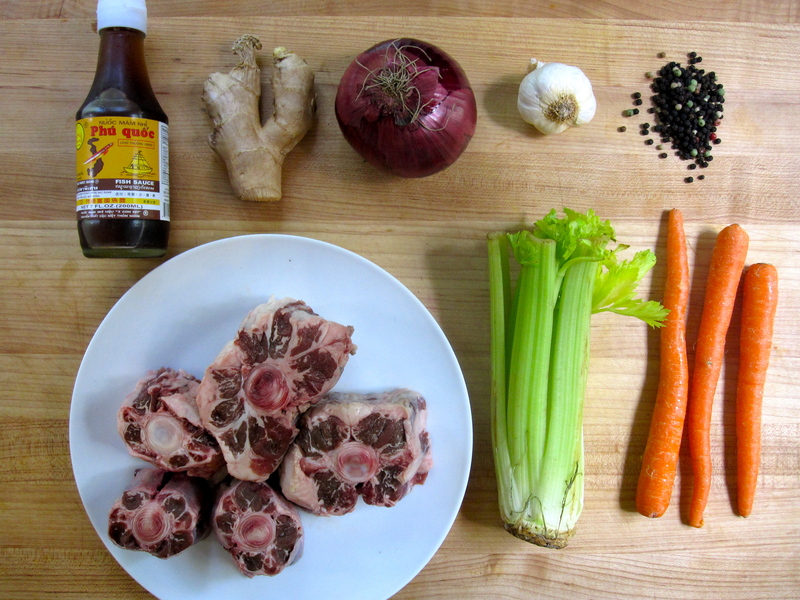 I created a marinade for the oxtail loosely based on a recipe from Kitchen Runway, which is a fabulous site with great recipes and lovely photos. I was just happy to see that someone was doing something a little different with oxtail AND shared my love of tacos! After the initial browning stage. Last weekend it was really rainy and overcast here in Omaha. Yes, it’s June, but because of the weather, I was craving chicken noodle soup. I didn’t want to do the expected noodle soup; I wanted to do something spicy, tangy, something that took me to another place when I ate it. 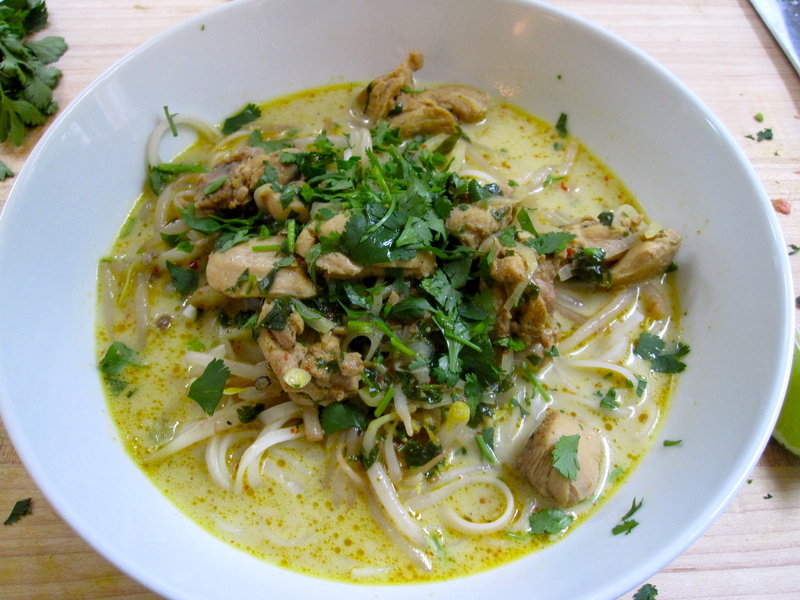 On one of my favorite websites, Food Republic, I found just what I was looking for: something called Chicken Laksa. One look at the ingredient list told me it was just what I wanted. And I only had to buy a few items! I cook with a lot of different spices, so I was glad to see that I had pretty much every spice on the list: coriander seeds, peppercorns, cumin seeds, fennel seeds, cloves, and turmeric. These spices featured a lot in Thai and Indian recipes (which I love) so I always have them on hand. I absolutely love going to the Asian market here in town. Shopping there transports me to another place. I can spend at least an hour in there, just walking around, discovering ingredients I’ve never seen before. I fully suggest you do the same. Find your nearest ethnic market, walk in, and immerse yourself in the food of that culture. You might be surprised what goes home with you in your shopping bag. This soup is really easy to put together. After you grind your spices, chop your shallots and garlic, smash your lemongrass, and cut up your chicken thighs, it pretty much all goes into one pot and boom! you’re done. I suggest giving this one a try. If, for any reason, you don’t have a spice or coffee grinder, you can use pre-ground spices from the market. Also, if you can’t find shrimp paste (I absolutely had to go to the Asian market for it) I’m sure you could substitute fish sauce. However, I know that I really loved the boost of flavor the shrimp paste gave. It doesn’t smell good, but boy, it was a lovely addition to the soup. If you do substitute, just be sure to taste, as both are salty and exact substitutions might be off. In a spice or coffee grinder, place first seven ingredients and grind to medium-fine powder. Set aside. Peel off outer layers of lemongrass stalks and give them a good whack on your counter. Or, if you’re feeling inclined, smash the core with a heavy skillet. Basically, you’re crushing them in order for them to give off their lovely lemony flavor (you’ll take them out of the soup at the end). Heat oil in a soup pot over medium heat. 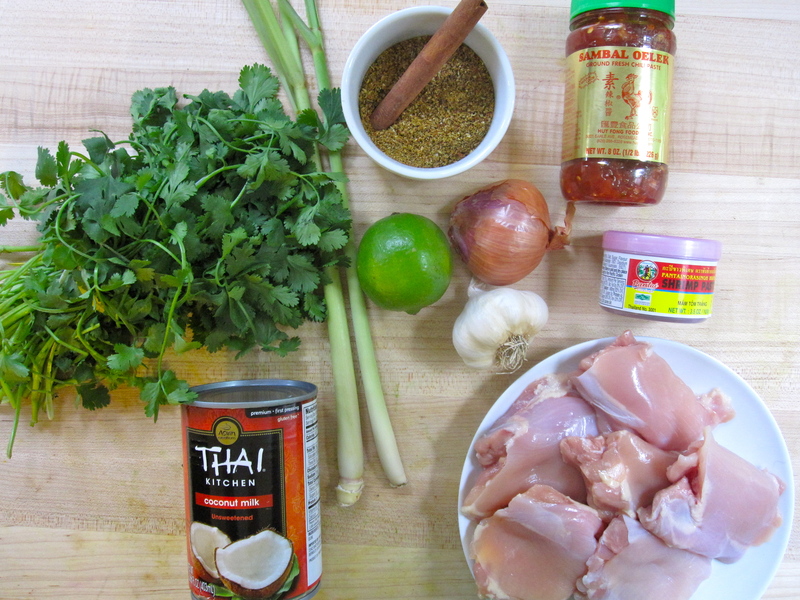 When hot, add the cubed chicken, shrimp paste, shallots, and spice mixture. Cook, stirring constantly, until fragrant, about 2-3 minutes. Add coconut milk, broth, sugar, and salt. Add cinnamon stick and lemongrass stalks. Bring mixture to a boil, then reduce heat and simmer, covered, for at least 20 minutes. In a separate pot, bring 3-4 quarts of water to a boil. Toss in bean sprouts and blanche them until softened, about 3 minutes. Using a slotted spoon or a spider, transfer sprouts to a bowl. Add noodles to same pot and cook until firm, but pliable, about 4-5 minutes; drain. Divide sprouts and noodles among bowls. Remove lemongrass and cinnamon stick from soup pot. Ladle soup into bowls and top with cilantro. Squeeze fresh lime juice over soup and add as much Sambal Oelek as your tongue can handle. If you’re going to store this for leftovers, be sure to keep components separate. When reheating, pour soup into saucepan and heat on stove over medium. There’s no need to reheat the noodles; the soup will take care of that. Rhubarb at the farmers market always excites me. I grew up with a rhubarb patch in our garden, and my mom would always make rhubarb pie for my dad. 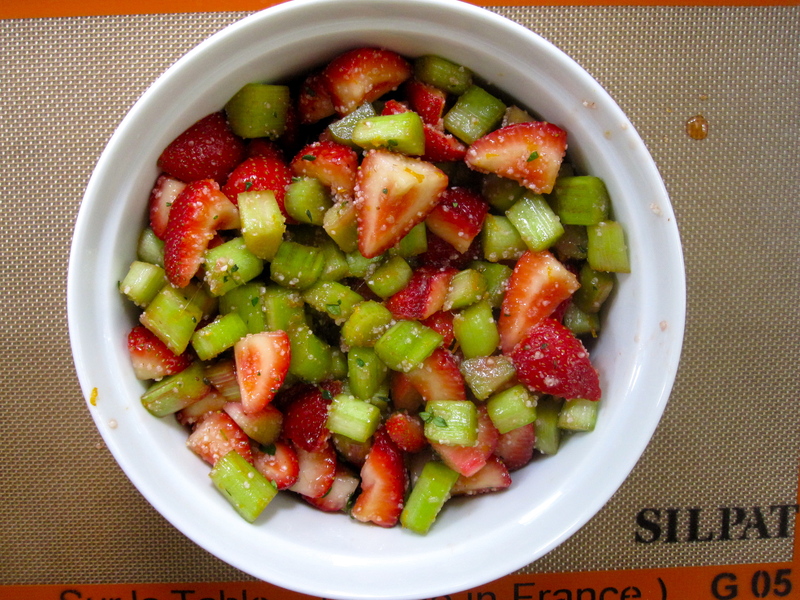 There was something about the tartness of the stalks mixed with the sweetness of the sugar that always stuck with me. Rhubarb is one of those ingredients that can be mixed with almost any fruit and thrown into a cobbler, pie, or crisp and taste delicious. This time, I chose to go with the classic pairing of rhubarb and strawberry. But with a couple of my own additions, natch. Cobblers are so easy that I don’t know why I don’t make one every week. How could you go wrong with sweet, warm fruit under a buttery biscuit topping?? All that is required of you is some fresh fruit and a few other ingredients, and wham! you have cobbler. 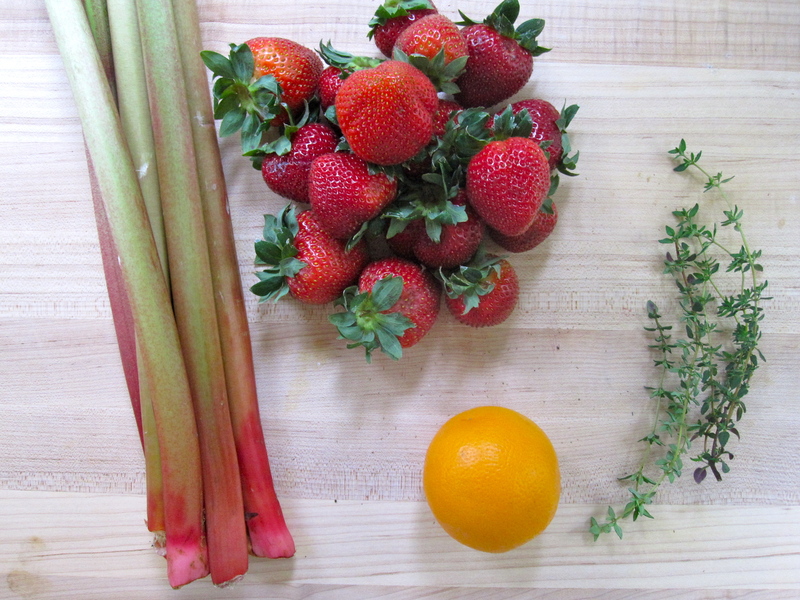 Listen, go out and pick up some rhubarb and strawberries from the farmers (or other) market and get started. You’ll be done before you know it and enjoying warm cobbler on your patio while you listen to the summer birds sing your praises!